This is a right handed or left handed double door UL listed press type panic emergency exit bar. The The 2200 Series Panic Exit bar by Sentry Safety is durable and reliable. This model is perfect for medium to high usage areas, making it suitable for warehouses, factories, schools, hospitals, or any other public building. In addition, the design of the mechanism makes this model the recommended panic exit bar for doors with glass inserts. The 2200 Series gives the consumer a number of installation options. This model can be installed on either right-handed or left-handed doors. 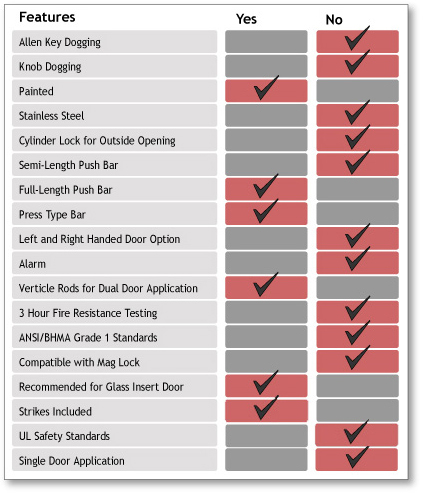 It is not necessary to select an option for right-handed or left-handed use; the bar comes ready to use for either type of door. Similarly, this panic exit bar is available in either red or stainless steel. Simply choose the appropriate option from the dropdown. Only the bar is available in color; the base and vertical rod are both black. Likewise, the most important option with this series is that is designed to open double-leaf doors, turning a dual door setup into a reliable and efficient emergency exit. Specifically, the vertical rods allow this model to be used on dual doors that have no column between the doors to which the bar can latch. 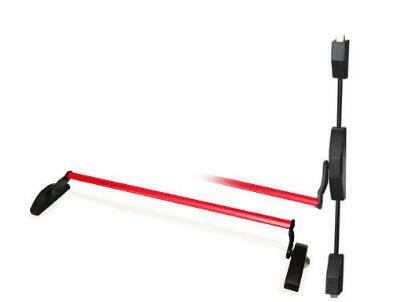 Finally, while the bar is only available with a length of 38", the customer can trim the bar down to the desired size.